I used to ask my dad what his favorite color was. This seemed like an important question at the time. He gave me an answer I thought was a cop out. I didn’t understand that, for an artist, this was true. I thought, surely, he couldn’t like black. as he left this world. and the dirt he never feared touching. Caitlyn Parris seeks to highlight the mystical within the mundane in her writing. She believes that the spiritual realm pervades and infuses the physical. When she is not writing, she enjoys teaching English as a Second Language, doing yoga, reading, cuddling with Momo the cat, and exploring with her husband Ben. 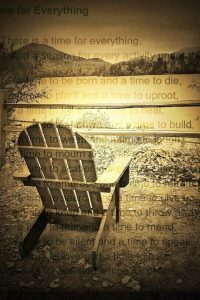 Photographer’s Note: This sepia photo represents the layers of brown images in the poem with the empty chair signifying loss of the speaker’s father. I overlayed Ecclesiastes 3 as this is the Bible verse I was reminded of when reading the poem. There is a time for everything. A time to mourn and a time to heal. In life and art, there is also a time for all colors. A time for red, a time for blue, a time for green…and also a time for brown.